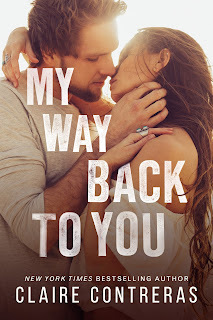 Check out my spoiler-free review of My Way Back To You by Claire Contreras. I binge read this one! 4.5 - 5 If you read Then There Was You (Second Chances Duet #1), there is zero chance of you missing the conclusion. My Way Back To You (Second Chances Duet #2) picks up right where book one left off. Rowan and Tess had so many obstacles to deal with. I devoured this emotion-packed booked right up to the conclusion. Rowan and Tess made some bad decisions and had to learn a few life lessons in order to be together. What a journey of the heart! This second chance story was full of angst and love! I’m hoping Freddie gets his own book. I have a feeling his secret job at The Company will continue to be very interesting.